These Bioderma Créaline cleansers require no introduction whatsoever. They're purported to be in every make up artist's bag and heralded to be the best cleanser humankind has ever created. The latter is a massive exaggeration on my part but after using it for 5 months or so, I'm a true convert. I'm no make up/skincare junkie but after being frustrated with one cleanser after another, I feel like I've hit the jackpot with these. It removes every bit of make up from my face without stripping my skin of its oil (or what's left of it). In an attempt to take as many shortcuts as possible......I don't bother with a toner nor make up remover because it does the trick. 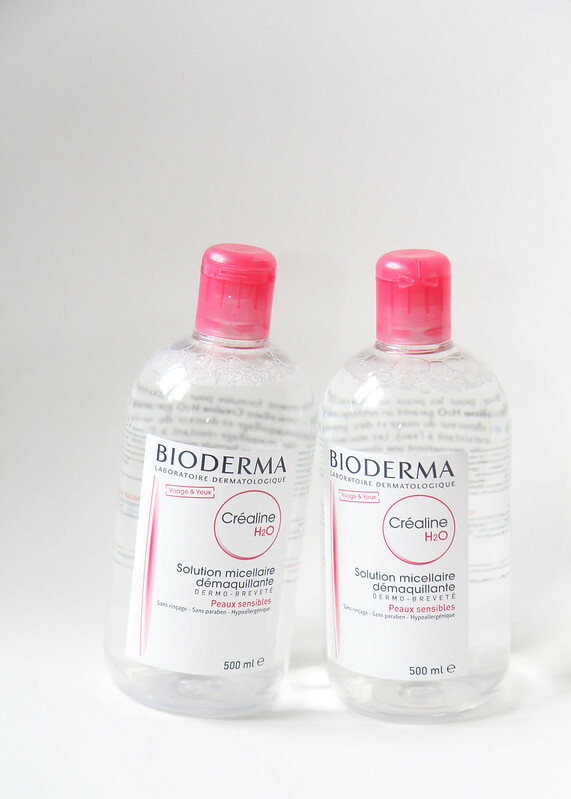 The Bioderma Crealine cleansing water is inexpensive and lasts forever but it's even cheaper at the Parapharmacie outlets dotted all over France. I think I paid just over €15 for two 500ml bottles. I was with a couple of friends who after seeing my rather enthusiastic verbal feedback, also bought several bottles each. Yup, I lugged two large bottles of Bioderma Créaline back in my suitcase. They're rather expensive outside of France so if you can, bribe a friend who's heading off to France to nab some for you. Failing that, the cheapest place to get your hands on these is Garden who's running a promotion on their dehydrated skin range (buy 1 bottle of 250ml and get another free). Your other option is Escentual or eBay. 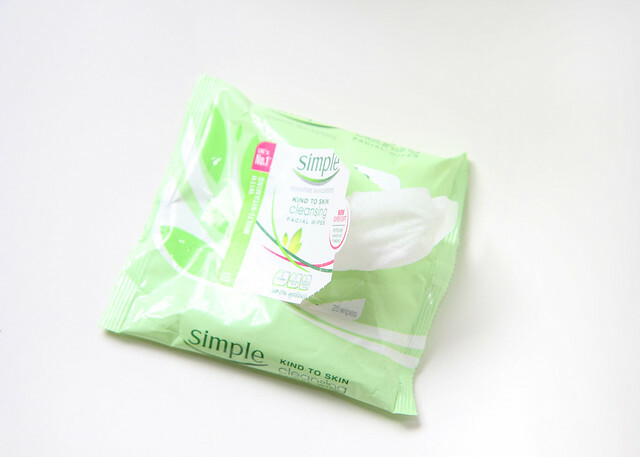 I have several packs of these Simple cleansing wipes in my bathroom at any given time. *Ahem* I don't use them on my face *blush* but rather............my bags. I've managed to remove color transfer (I was wearing black skinny jeans) on my red lambskin Chanel purse. Using a cleansing wipe, I gently dabbed across the back of my Chanel WOC and it lifted all the dye transfer without damaging the leather. The lambskin is rather fragile and after a few costly mistakes on lighter colored lambskin Chanel bags, I've stopped using leather cleaner as they leave a permanent mark. With any dye transfers, do get on to it as quickly as possible. I cleaned mine 24 hours later. Secondly, not all cleansing wipes are created equal. These ones from Simple are fragrance and alcohol free. I've been cleaning Hermes and Chanel bags including my clients' for a decade now. You can revive a Chanel caviar bags quite easily using these wipes but do test on a small corner of the bag if you're attempting to clean a light colored bag. The wipes don't work as well if you're trying to clean uncoated cowhide leather on Louis Vuitton bags. You're better off using a white eraser to rub off any dirt marks. Do share your tips on cleaning bags if you have any. I'm going to look into the cleansing water, it sounds pretty amazing. I don't have the time or patience for toners and serums. I use a scrub, and moisturiser (and I often use moisturiser to get my make up off as well)! Just discovered Caroline Hirons the other week (obvs I was living under a rock :) Her routines cheat sheet was like... what you mean cleanser on a dry face? :O what you mean toner? It would never occur to me because - sensitive skin! But... found a cheapo toner for sensitive skin by some French pharmacy brand so well what the hell... and do you know my skin looks really good (or my eyesight has deteriorated rapidly :) Haven't turned into a singing detective or anything. I do like having morning/evening routine, yes it can be a pain in the ARSE sometimes, but a) it normally takes 5 mins tops and b) it can be rather soothing. I've been meaning to try the Bioderma cleanser and it's purported awesomeness for ages now. I should get on with that! Great post!! I will have to go get some of these wipes Stat!! I'm always so worried about color transfer that I have hardly been carrying my nicer bags because I'm so worried. I made a mad dash to the a drugstore when I found out that the entire back of my Chanel WOC had black dye residue. Thankfully, the marks came out quickly. But make sure you dab, not rub. I have these simple wipes for my face, but thank you for sharing that they are great for bags too! I am always scared about carrying my nicer bags incase I get dye from my jeans or dirt on them! Have you ever tried the wipes on Chanel lambskin? Or have any suggestions for cleaning slight black smudges on light lambskin (probably from whatever I was wearing)? Thanks!